It was about four years ago that I received a call from a fellow martial artist. His name is Sifu Mark Mandron and he is the highest level disciple in the USA of the noted Master Fu Shu-yun of China. He wanted to tell me that his teacher knew of me, through Ch'ang Tung Sheng. She was aware of Ch'ang's accepting me as his son. However, she was surprised to see her picture in my Tai Chi book entitled Ch'ang Shih Tai Chi Ch'uan. On page XII (see figure one) there is a picture given to me by Ch'ang Tung Sheng which contains noted kung fu masters of the time. If you look at the top row in the middle you will notice a woman. This is Master Fu Shu-yun. On the bottom right side is Master Ch'ang Tung Sheng. Sifu Mandron went on to say how both Master Fu and Master Ch'ang Tung Sheng shared training experiences together in China's most prestigious kung fu training academy, the Central Martial Arts Academy in Nanking, China. There Master Fu and Master Ch'ang started their lifetime friendship. It is no wonder that Master Ch'ang favored her, since Master Fu's Shao-lin kung Fu skills ranked very high amongst her peers. On a personal level I feel very lucky and honored to have Master Fu in my life. Perhaps, as my Chinese friends say, fate had a hand in our meeting. I searched for a number of years for an authentic Chinese Master. Even though I saw some fairly talented individuals, none of them gave me the feeling that I was looking for. My first glimpse of Master Fu was enough for me to know that I was not chasing shadows, that here truly was a Master. From the first class that I took with Master Fu, up until the present time, I never cease to be amazed at her level of excellence and seeming unlimited knowledge of the Martial Arts. As she painstakingly brings me from one level of training to the next. I marvel at her patience and unselfish giving of her time and knowledge. At times, I forget that she is in her 70's, because she still moves like a young person with grace and agility. When I do think about her age, I often wish I had met her earlier in my life, but this cannot be. I will always be thankful for the time that I had with her in the past and for time coming in the future. I have the honor of being Master Fu's senior student here. Whenever I can, I set up demonstrations for my students and any interested persons, so that they can experience the beauty and perfection of seeing a real A Chinese Master perform. At these times, Master Fu seems to light up and become larger then life. To me the greatest compliment I can receive is when someone says, I can see your teacher in your performance. I am sure I speak for all of Master Fu's students when I say we love her as a teacher and also as a warm outstanding human being. Master Fu had a sickly childhood. Her family wanted her to study martial arts to improve her health and stamina. It required large sums of money to pay for instruction and people of that time needed the money for extra food, plus there weren't many women who had the talent or interest to study with the intensity that Master Fu did. Master Fu's family was financially stable and had a deep appreciation for the martial arts, her father and grandfather were both military men, so her family encouraged her to study Shao-lin. The martial arts were not strange to her since her uncle had studied Japanese wrestling and on many occasions would practice at her home. Viewing these classes she became interested in learning some kung fu. She began her training at the tender age of nine in elementary school. In Chinese grammar schools it is common to have Military Instructors present to teach the children discipline, and how to form lines and stand at attention. One day, one of the instructors was practicing his kung fu and all the children noticed him. When the instructor volunteered to teach them some Shao-lin, they all jumped at the opportunity to learn. Master Fu was part of that group. She remembers that the more she practiced the stronger she became. It was not long after that she stopped taking her medication. The group became proficient at Shao-lin and would give demonstrations at the school. She was overjoyed at the loud applause they would give after she demonstrated her Shao-lin skills. Master Fu very much enjoyed the attention which only increased her enthusiasm to learn more. She continued her training at the Tienjin Martial Arts Club during her summer vacations. Master Fu graduated from the Hebei Girls's Teacher School and then entered the Nanjing Central Martial Arts Academy (see figure three, Master Fu in uniform in the 1930s). The Nanking Academy was the very pinnacle of martial arts training. At the Nanking Academy all forms of styles were taught. The Academy had the reputation of having the very best of Martial Arts teachers on its staff. Such names as Yang Cheng-Fu and Sun Lu-Tang and Huang Bo Nan was among those who taught there. Each one of these instructors in the own right was among the best Kung Fu had to offer. And Master Fu worked with all of them. Most students will work under only one or two masters in their whole life. Master Fu had the rare chance to work with many of the top names, all under one roof. Master Fu mentioned how demanding all her instructors were. Many of her classmates could not handle the intensity of the training, and soon left the Academy. Master Fu not only kept up with her training but also excelled in it, becoming a favorite of many of the instructors. Master Fu remembers the principal of the school, Zhang Zhi-Jiang, a high ranking government official who had a special place in his heart for martial arts. It seems he had a terrible fall from a horse and injured his back seriously. He practiced Eight Pieces of Brocade (Ba Duan Jin) to help him recover from his injuries. Because he understood the value of martial arts training he made every effort to bring only the best instructors to the Academy to teach Shao-lin. It was at the Academy where Master Fu and Master Ch'ang became friends. She noticed Master Ch'ang because he too had a passion for perfection of his art. Both Master Fu and Master Ch'ang had the same training habits. They would both arise at 4:30 a.m to practice Kung Fu even before formal classes began. She remembers seeing Ch'ang running up hills to strengthen his legs and kicking trees. To develop his arms and upper body he would practice wrestling on large ceramic jars. Master Ch'ang also noticed Master Fu as she practiced her various art forms. Master Fu and Master Ch'ang did not socialize while at the Academy, as this was forbidden. However, their friendship grew when both Master Ch'ang and Master Fu returned to Taiwan. They stayed in close communication with each other for the remainder of Ch'ang's life. Master Fu said Ch'ang was already famous when he came to the Academy, his position at the Academy was that of an upper classman and assistant professor. Master Fu remembers some of his fights and observed Ch'ang to be a careful fighter, always eyeing his opponents and learning their weaknesses. He never rushed into a challenge, but rather carefully figured out how he would defeat each opponent well before the fights even began. Master Fu rarely gives compliments, but she describes Master Ch'ang as a genius at Shuai Chiao, and it is seldom Master Fu said this about anyone. 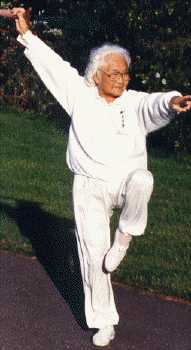 At the1936 Olympic Games, Master Fu represented China performing her Tai Chi. This was indeed a great honor as there were only nine people picked from all of China to represent their art style. She did so well that she began traveling to Hong Kong, Singapore, Bombay, India, Venice, and Rome. On her team were some of China's best martial artists, names such as Liu Yu-Hwa, Jing Shi -Sheng and Kou Yun Xing all from Henan, and Zheng Huai-Xian and Zhai lien-Yuan from Shanghai and Zhang Er-Ding form Beijing. In 1971, Master Fu was invited to teach at the National Taiwan normal University in Taipei. Her fame became so well known, she was soon asked to star in some Martial Arts movies. One famous movie, "A Sunset in the Forbidden City" today is a classic of martial arts movies. Master Fu still has a full life, teaching her Kung Fu to those she thinks have the potential to learn. Although no longer a young woman, she still travels between Taiwan and the United States teaching her arts. It is our hope that Master Fu on her return to the United States will come to our humble center and share with us the her wealth of knowledge. Masters such as Master Fu Shu-Yen are fast becoming rarities. These are the great masters who have given birth to today's generation of martial artists. Because of masters like Master Fu Shu-Yun our art has endured the passage of time, unchanged, and is ready to be handed down to the next generation of followers. I think I can speak freely for all of us who truly love the Shao-lin Arts when I say; Master Fu, you have our deep gratitude for all you have given so willingly to foster our beloved art.